Manufactured in the USA and Built to last! 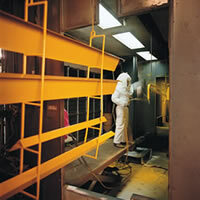 Wildeck's skilled employee owners utilize "lean" manufacturing processes to fabricate industrial steel work platforms (mezzanines), equipment or machine platforms, VRCs (Vertical Reciprocating Conveyors), RML (Rideable Material Lifts), access solutions, and the industry's toughest safety guarding products: including protective guard rail, safety gates, stair systems, vertical ladders, conveyor crossovers, and related material handling products. Wildeck's 100,000+ square foot U.S. manufacturing facility is second to none and includes: precision shearing, brake forming, fabrication, manual and robotic welding, painting, mechanical and electrical assembly, testing, packaging, shipping/receiving, and offices. 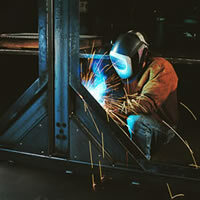 Welding is performed by AWS D1.1 Certified Welders who provide precise quality welds on all structural grade steel. This ensures that your Wildeck® platform/mezzanine, vertical reciprocating conveyor (material lift), and safety guarding products will be built to last. 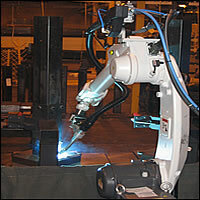 To further enhance Wildeck’s reputation for quality U.S. manufacturing, an automated 6-axis robot welds numerous guarding products, plus various mezzanine and VRC parts using customized welding fixtures. This increases efficiency and ensures repeatable, quality welds that you can depend on. It's a level of quality and craftsmanship you won't find anywhere else. Wildeck products and accessories are protected with a highly durable paint finish that provides increased protection when compared to other paint processes. Standard colors are either Wildeck® Gray (ANSI 49 Gray), and/or Safety Yellow. Several optional Custom Paint Colors are available to meet your needs and special paint colors can be mixed to your specifications to comply with specific facility requirements. A computer-controlled 7-step process electrostatically applies a tough 2-part polyurethane coating with superior results similar to an automotive clear-coat finish. Wildeck’s new eco-friendly 100% phosphate-free metal pre-treatment process maintains the company’s uniform high quality finish while improving paint line productivity, reducing emissions and waste, and lowering energy consumption. From performance-proven products and accessories to a state-of-the-art automated paint line that brings out the best in their appearance and durability, you can rely on Wildeck quality. Take a close look and you'll like what you see. 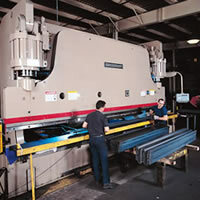 Wildeck utilizes a 600-ton automated CNC controlled Brake Press to process complex bends in all sheet and bar steel from downloaded computer programs. It bends C-Sections up to 20-ft long, as well as guardrail components, stair stringers, stair treads and other materials. There are very few brake presses in the area that can handle 20 ft long material. Whether it's precision metal forming, welding, or finishing; Wildeck manufacturing provides a level of quality and craftsmanship you won't find anywhere else.